Wash and chop all the parsley and scallions and set aside. Chop dates and set aside. Zest and juice lime and set aside. Heat water in a kettle. Meanwhile, zest and juice lemon. Add couscous and boiling water to a pot and add salt, lemon juice, toasted sesame oil, maple syrup, and lemon zest. Stir to combine, cover, and let cook for approx. 10 - 15 min. Add chickpeas, peas, garlic, half the chopped scallions, a pinch of chopped parsley, cilantro, half the mint, caraway, ras el hanout, lime zest, pistachios, vegetable oil, salt, and pepper to a large bowl. Purée with an immersion blender until well combined. Add chickpea flour, baking powder, and corn starch to the bowl and knead with your hands. Then form small falafel balls. Heat oil in a clean pot over medium-high heat and deep-fry falafel for approx. 3 - 5 min. Transfer to a paper towel-lined plate to drain excess oil. Fluff the couscous with a fork. Add chopped dates, remaining chopped parsley, and remaining chopped scallions to the couscous. Use your hands to shred remaining mint into the Greek yogurt, then add with garlic powder, lime juice, salt, and pepper. 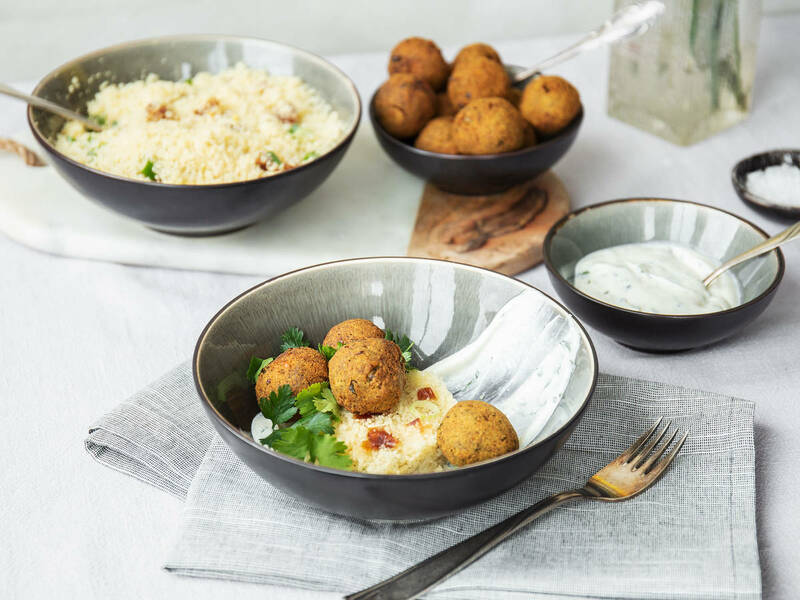 Serve falafel with couscous, mint yogurt, and flatbread, if desired. Enjoy!